The summer of 2016 is the summer when I learned to love figs. Thanks to some friends who have a huge fig tree that produces the sweetest fruits, I’ve been lucky to have an abundance of figs to eat on their own and to use in baked goods. The latest fig-themed dessert to come out of my oven is a Fig and Almond Cake. This hearty but delicate cake perfumed with almond extract is nutty, tender, and barely sweet. Figs are scattered on top of the cake batter and sprinkled with a bit of sugar to caramelize in the oven. The cake is best eaten the day that it’s baked as it tends to get mushy pretty quickly because of the moisture from the figs. If you want to learn a little more about figs, check out this article on how figs get pollinated. A bit of a warning though, the details are a bit of a horror movie, and depending on how easily grossed out your are, you may never want to eat a fig again. So remember, you’ve been warned. The cake comes out looking beautiful with figs scattered over the top of the cake batter [even though I put my figs “wrong side” (cut side down ) up]. Butter or spray a 9-inch fluted tart pan or pie pan (I used one with a removable bottom, and that helped ensure that the cake stayed intact when I removed the outside of the pan); set aside. Put almonds and 1/4 cup sugar in a food processor and grind to a coarse powder. The finer you ground the almonds, the less crunchy the cake will be. Add flour, baking powder, cinnamon, and salt; pulse to combine. In a large mixing bowl, whisk together eggs, melted butter, honey, and almond extract. Add the dry ingredients (the almond mixture) to the wet ingredients, and stir together until batter is just mixed (don’t overmix). Remove the stem from each fig, and cut the fig in half. Arrange the fig halves cut-side up over the batter. Don’t leave a large space between figs as they will shrink when they bake. It’s OK if the figs are touching each other. Sprinkle 2 tablespoons of sugar over the figs. Bake for 25-30 minutes, until the cake is golden outside and dry at center when probed with a cake tester. Note: This cake is best when eaten on the day that it’s baked. During the past three weeks, I’ve been living in a thick fog of preparing to move, moving, and unpacking. In the midst of it all, I’ve been eagerly eyeing my new stove/oven, reading the thick manual (it’s so fancy that it has a Sabbath mode), and researching recipes to try. I used an electric stove/oven for the past four years, so there will be a bit of a learning curve as I get used to my new high powered gas oven. Luckily I’ve found some recipes that are very forgiving and taste fantastic, even if things are slightly overbaked. These Chocolate Almond Muffins were the first recipe I tried in the new oven. I was especially drawn to the recipe because of the use of copious amounts of almond paste and the promise of deep, dark chocolate. 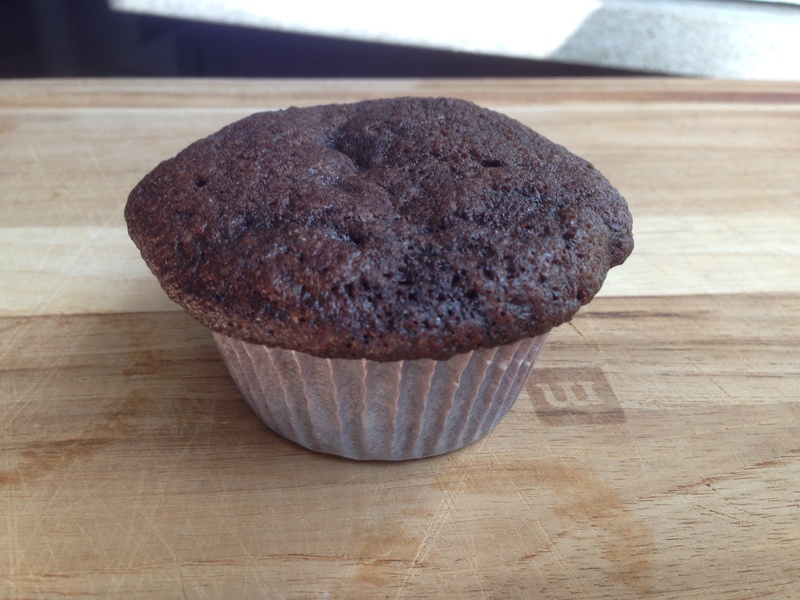 I was not disappointed as the muffins were delicious with a tender, delicate texture and a floral almond flavor that was well balanced by the deep chocolate. Because the muffins aren’t too sweet, they’d be perfect for breakfast too. The one caveat is that the list of ingredients can be a bit daunting for baking pantries that aren’t well stocked. Some “specialty” ingredients that I had to add to my pantry for this recipe were a large tub of almond paste (the tube won’t be enough), brown rice flour, and black cocoa. As you can see below, the muffin tops don’t rise very much, but they spread out to create slightly crispy, crackly edges. Position a rack in the center of your oven and preheat to 350°F/180°C. Line two 12-cup muffin pants with 16 paper liners, spacing them evenly between the two pants. In the bowl of a stand mixer fitted with the paddle attachment, beat the almond paste, granulated sugar, salt, and cocoa powder on medium speed until the mixture looks and feels sandy. Be sure all the almond paste is broken up into a fine meal with no clumps. 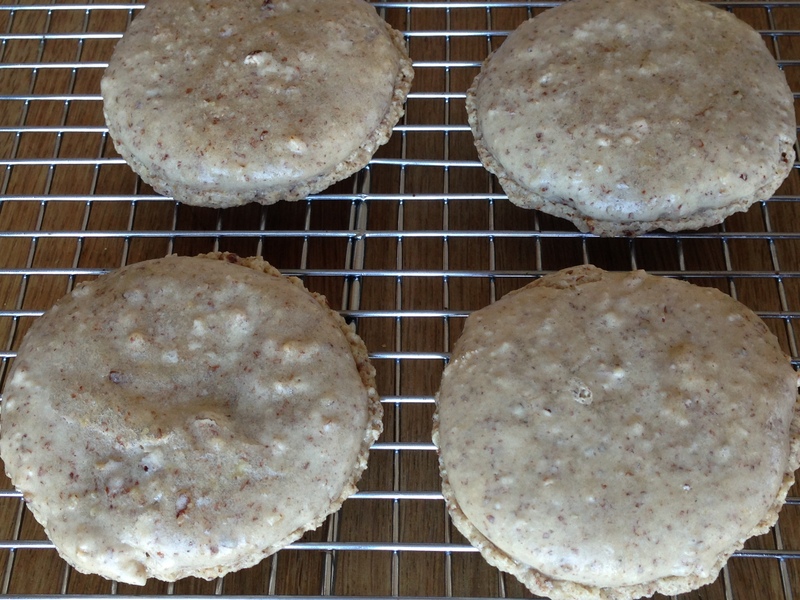 [Making sure the almond paste is not lumpy is really important, otherwise your muffins will bake up with with lumps of almond paste that will leave your tasters wondering, “what is that?” in a bad way]. Add the butter and beat for 1 to 2 minutes on medium. Add the vanilla, then pause mixing. Add both flours, the baking powder, and chopped chocolate. Mix on low speed, just until incorporate; then fold by hand to be sure it’s properly, but gently, incorporated. Fill the muffin cups with batter, all the way to the top, then bake (the muffins to do not rise much). If both pans won’t fit on the center rack, just bake in batches until the muffins just barely spring back when pressed, 20 to 22 minutes. [Use skewers to loosen the edges of the muffin tops from the pan.] Allow to cool completely before dusting with powdered sugar. After several weeks of Nutella-themed baking activities, I thought that my Nutella baking obsession had gone into hibernation for a while. But all it took was a Facebook friend’s post about Nutella ice cream to pull me back in to the dark (chocolately hazelnut) side. Armed with a new (impulse buy) Nutella cookbook, I decided to make financiers stuffed with Nutella. 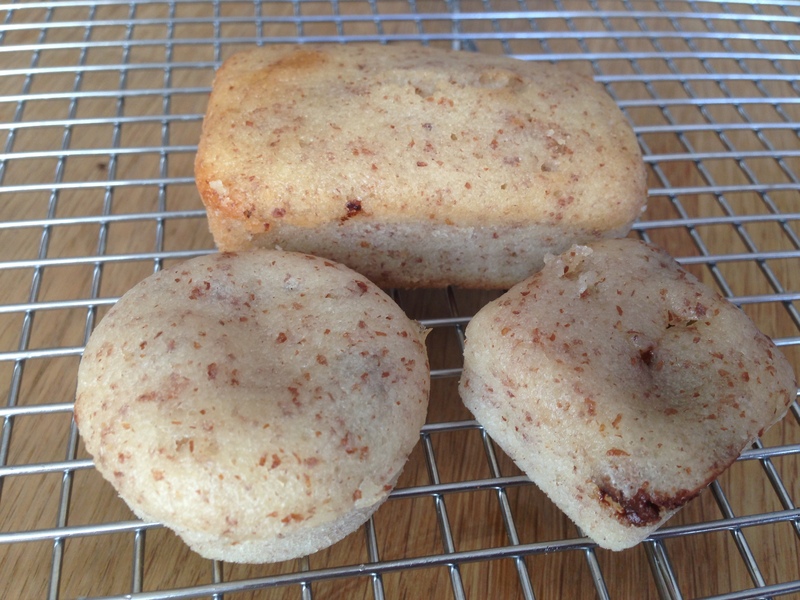 Financiers are typically small rectangular almond cakes with a plain look to them, and as with many French cakes, they’re light and moist in the inside. Even though I’ve come across financiers in the many pastry displays I’ve oogled, I had never eaten one before because all the other surrounding pastries just looked so much more appealing. But as I learned after making these financiers, looks can be deceiving. And when you stuff them with Nutella and bake them up just right (i.e., not overbaked), people start eating them like potato chips (just can’t eat one!). My only complaint with these is that the silicone pans I used to bake them in were really difficult to clean afterwards. So, this recipe will be relegated to my “special occasions” dessert list. It doesn’t matter if you don’t have financier pans. I baked mine in a variety of shaped pans. My goal was to have as close to an equal ratio of Nutella to cake as possible without causing the cake to explode. 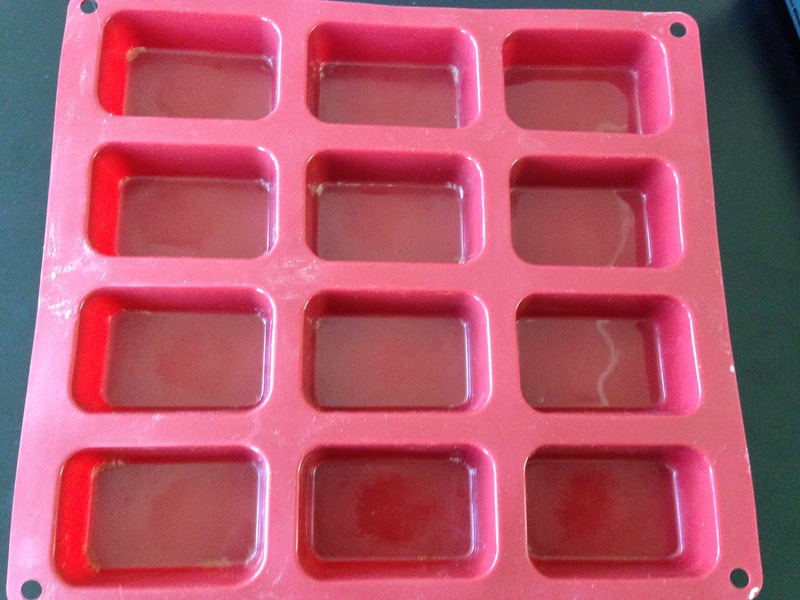 Makes: It depends… I used several different pans/mold including round, square, and rectangular silicone molds. Note: The recipe I used was kind of vague in its instruction. So I had to do a little bit of trial and error to determine the best amount of baking time. Prepare pans by greasing them well or spraying them with baking spray. These cakes will stick to the pan, so make sure you don’t skip this step. Melt the butter in a small saucepan over low heat or microwave it for about 20-30 seconds. Set aside to cool a little. In a medium size bowl, whisk together the flour, powdered sugar, and ground almonds. Add the egg whites, one at a time, to the flour mixture and beat well after each addition. Add the melted butter (make sure the butter is not too warm so that it won’t curdle the egg whites) to the flour and egg mixture, and mix well. Fill your greased pans about 1/3 with the cake mixture. 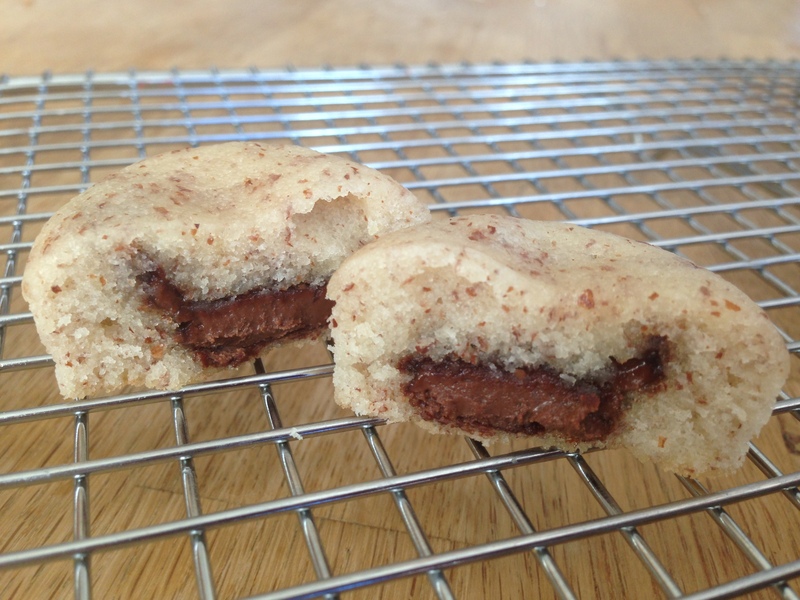 Using a small cookie scoop (if you have one), drop Nutella on top of the cake mixture (make sure to leave room for the top layer of the cake mixture to cover the Nutella). Then cover the Nutella with a layer of cake mixture. Leave about 1/3 to 1/4 of the top of the pan empty as these cakes will rise a little as they bake. Also, make sure that the top layer of the cake mixture completely covers the Nutella. The round and square cavity pans took about 8 1/2 to 9 1/2 minutes to bake. The rectangular cavity pans took about 10 1/2 minutes to bake. 9. Remove the pan from the oven, and let the financiers cool in the pan. After they’ve cooled, you might need to use a butter knife to loosen the edges from the pan.